The Miracle on State Street | Midtown Development, Inc.
Landscaping and paving are not winter construction activities, but the record-breaking warm weather allowed Molon Excavating, Inc. crews to completely install all the underground utilities and the Grand Traverse Construction concrete artisans to work their magic on the beautifully crafted, heated driveway and motor court. Traverse Outdoor Maintenance landscaping crews wrapped it all up with beautiful landscaping just in time for Christmas! 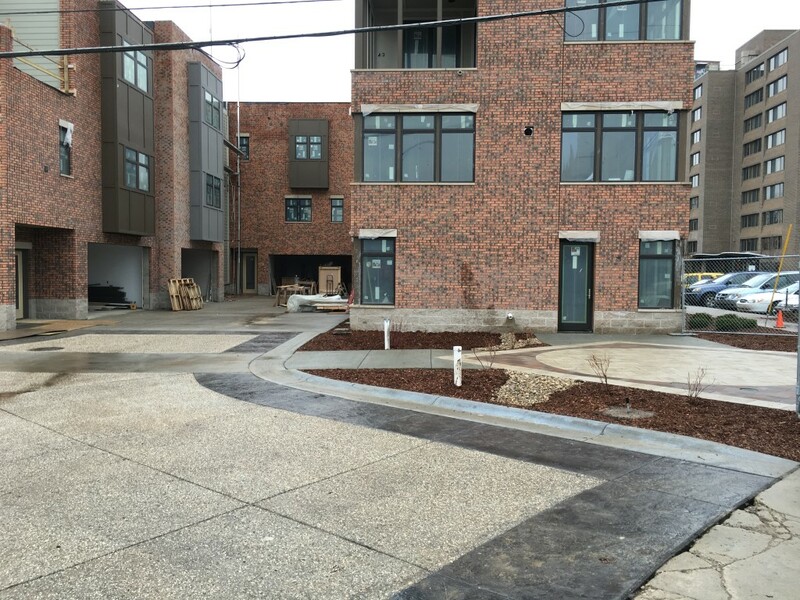 So, as Phase 1 nears completion, the five riverfront townhomes in Phase 2 are getting well underway. 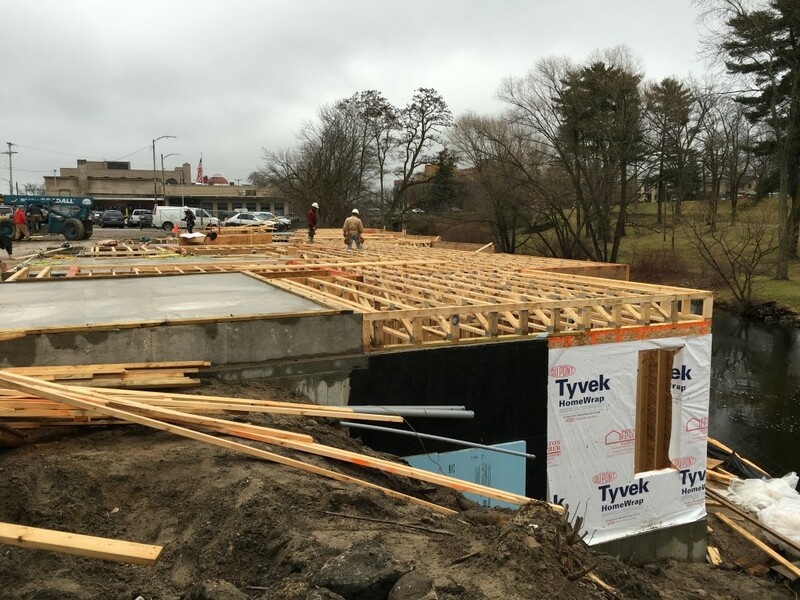 Precast concrete planks were set last week and the main level floor trusses are just about ready for decking! 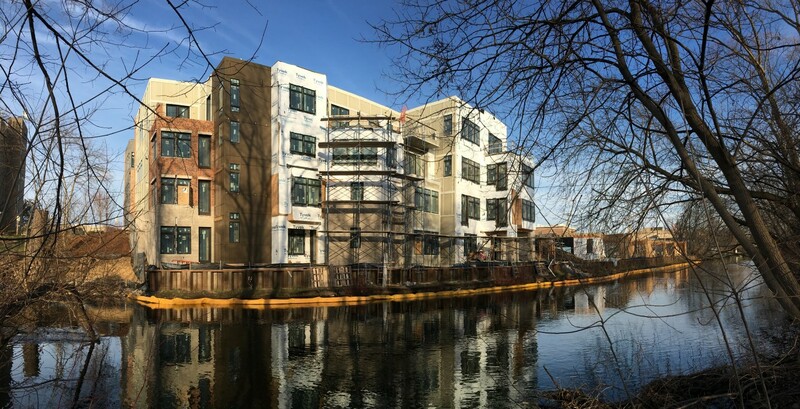 Three of these amazing Riverfront Townhomes in this phase are still available, custom designed and finished with features you won’t find anywhere else: 2 car garages, private elevators, green roofs and walk-out basements just 10 feet from a blue ribbon trout river with park views. Privacy and autonomy to the max: no shared hallways, elevators or stairwells; no one above or below you; no shared mechanical systems. This entry was posted in News, Uptown-Riverfront living downtown TC and tagged Boardman river condos, Condo developments traverse city, Garden Roofs, Riverfront Condos, traverse city town homes, Uptown, Uptown Condominiums, Uptown Condos, Uptown Garden Roofs, uptown riverfront townhomes, Uptown Traverse City. Bookmark the permalink. Midtown Development Inc. is the premier infill developer in Traverse City with extensive experience in downtown residential condominiums. We understand the movement to return to urban living and subscribe to the principles of the New Urbanism and Smart Growth. Our developments resonate with the groundswell of people who are focused on sustainability and a desire to live “green”. Projects include River’s Edge, Midtown Centre, Fairway Hills and Traditions.